At this point documentation on Joseph Wicksall begins to get a little scarce. 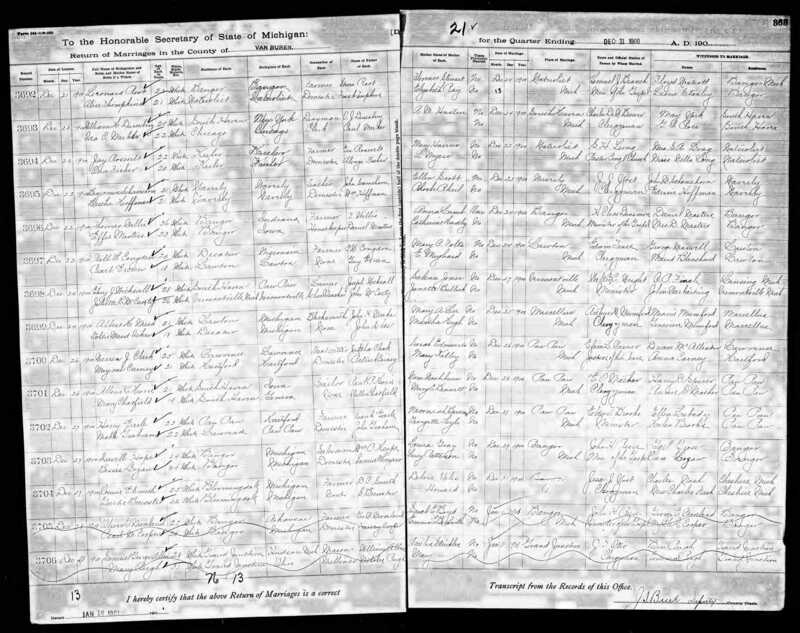 The 1890 Federal Census records were destroyed in a fire but based on the marriages of William and Grace it is pretty clear that the family has moved to Breedsville. Also in the “Biographical Sketches of South Haven” it says Guy Wicksall was educated at Bangor High School and graduated in 1890. Bangor is just a 4.5 miles southwest of Breedsville. 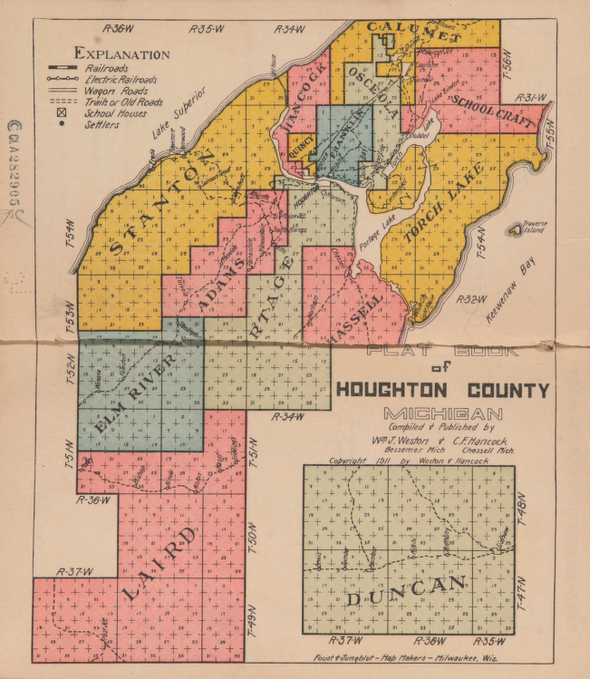 On July 30th 1891 Joseph Wicksall of Houghton County purchased 120 acres of land. The description of the land is as follows: “The East half of the southeast quarter and the southwest quarter of the southeast quarter of section nine in Township fifty two north of range thirty four west of Michigan Meridian in Michigan containing one hundred and twenty acres”. Based on the coordinates it looks like the Houghton County land was in the Portage township. 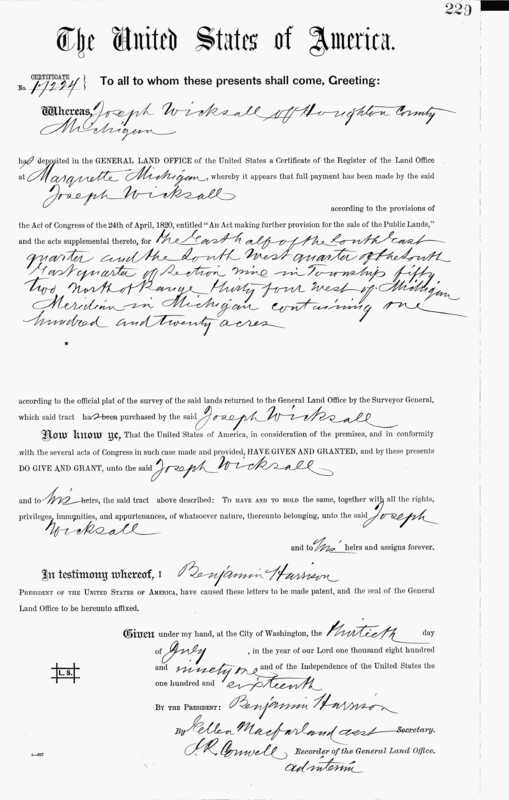 Guy Wicksall served as a clerk for Portage Red Stone Co. of Jacobsville, Houghton County, Michigan for two years (W.A. Norton's Directory of South Haven Page 248). According to Wikipedia, “Jacobsville is an unincorporated community on the south side of the Keweenaw Peninsula near the outlet of the Keweenaw Waterway at 46°58′51″N 88°24′36″W. It is the site of sandstone quarries that are now shut down but formerly supplied red sandstone for buildings throughout North America and Europe.” Jacobsville is due east of the land bought by Joseph. So it looks like Guy, being the youngest child, followed Joseph north to Houghton County after graduating from high school. 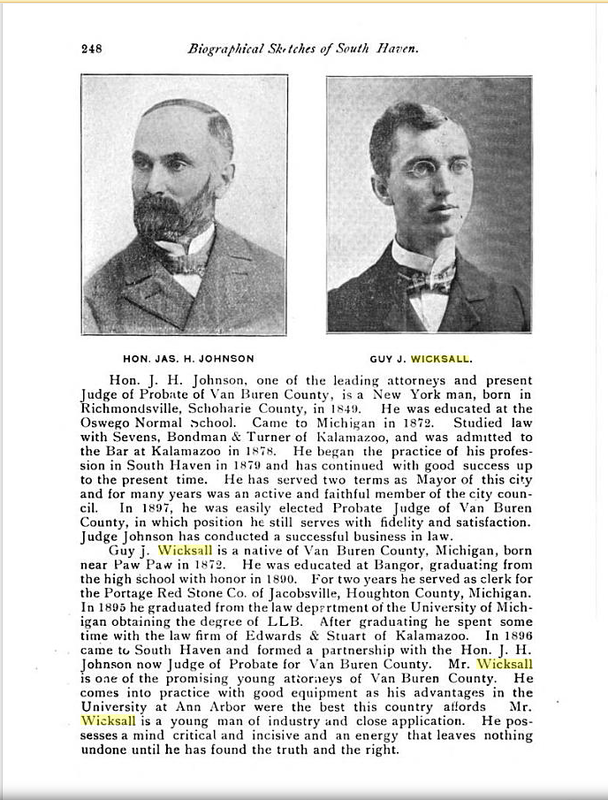 Guy Wicksall graduated from the University of Michigan in 1895 with the degree of LLB and in 1896 moved to South Haven after a short time in Kalamazoo. On December 27th 1900 Guy J Wicksall married Juliette McCarty in Vermontville Michigan. An article in the South Haven Daily Tribune states "Mr. Joseph Wicksall of Bangor was in attendance". In the April 3rd 1907 Edition of the South Haven Daily Tribune on page 4 you find the following: "Mrs. John Grills and daughter, Miss Myrna, and the former's father, Joseph Wicksall, are spending a few days with relatives in Kendall." They were likely visiting Joseph's daughter Vietta Becker. On December 23rd 1910 Guy J Wicksall died after fighting a three week illness listed as pneumonia followed by septicemia on his death certificate. His father's place of birth is listed as New London, Connecticut and his mother's is listed as England. On that same day the Daily Tribune in South Haven dedicated a large section of the front page to Guy’s death. In the obituary it states “Joseph Wicksall, who has made his home here with his children for several years”. 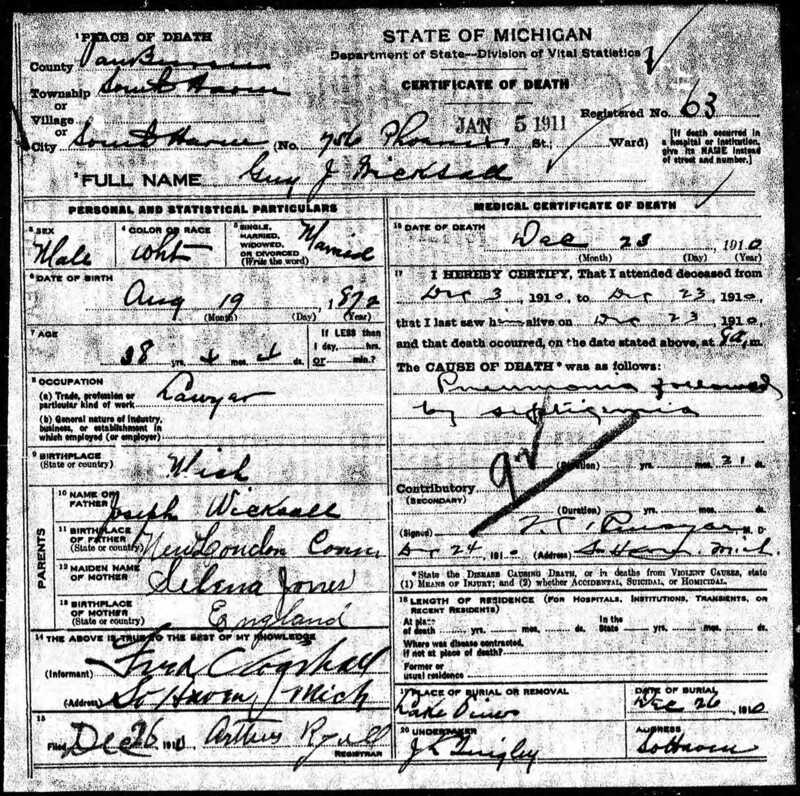 So far I have been unable to find Joseph on either the 1900 or 1910 census in South Haven or anywhere else. 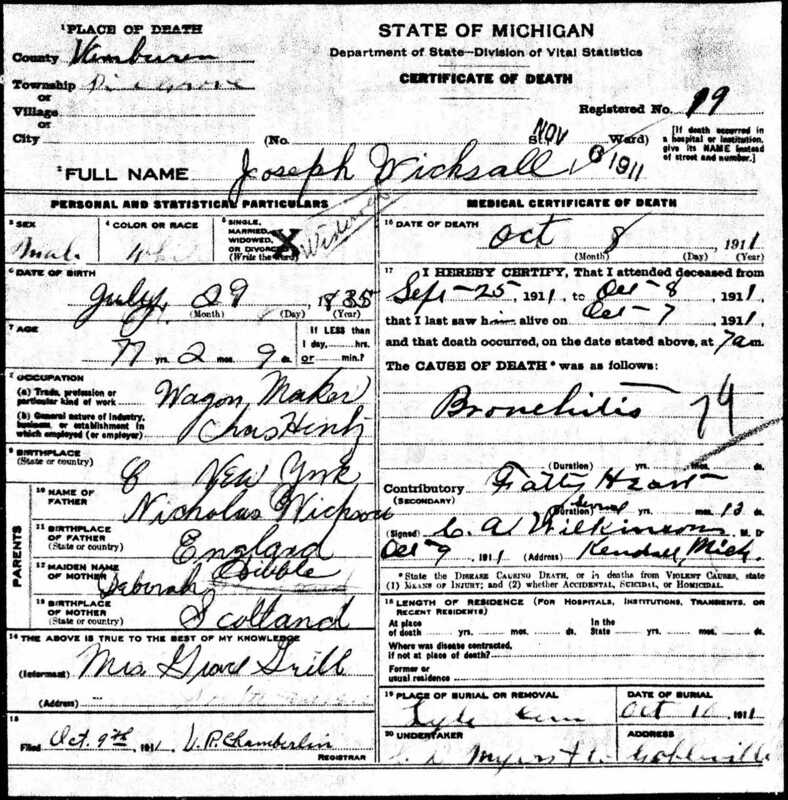 Joseph Wicksall died on October 8th 1911 in Pine Grove Michigan. Although it is likely he was living with his daughter Charlotte Vietta Becker in Pine Grove, the death was reported by his daughter Mrs Grace Grills. His death certificate lists the cause of death as bronchitis and a faulty heart as a contributing factor. His profession is listed as Wagon Maker. His birthplace is listed as “C New York”. Father is Nicholas Wicksall from England and mother is Deborah Dibble from Scotland. There is obvious confusion over the birthplaces of Nicholas, Deborah and Joseph. Deborah’s last name was also corrected although I cant read the original. The death certificate lists place of burial as “Lyle Cem”. There is an occupant list that shows him with Selena in Cuddeback Cemetery. Again, Cuddeback Cemetery is also called Three Mile or Lyle Cemetery. There is no headstone.